For our final project of the term, we had the opportunity to work together with Nicole from GDC. She gave us a project brief, some background of the GDC, and some pain points that she was already aware GDC had. In our research portion, I helped create a survey that went out to all of IDEA as well as IDEA alum, identifying the relationship GDC had with design students. The survey generated the results we expected – nobody was really aware of what the GDC offered and subsequently did not see any worth in paying for a membership. For this project, I teamed up with Sara and Sharleen to create an annual mentors conference that would connect students with industry professionals. I hadn’t previously done a team project in this program yet, and I am so glad that it was such a wonderful experience! Between the three of us, the work was split evenly and each member delivered wonderful results. My main role was to create the entire website and logo, as well as make some small collateral including stickers and a pin. We met up on the weekends the work together and had very good communication aomg ourselves. We started off by each bringing in two mood boards of what we wanted our project to feel like. In class, we laid out all our moodboards and discussed what we liked, what we didn’t, and what we thought would connect with our target market the most – while making us stand out from conferences that already exist. When we first met up to show each other what we worked on (during the halfway point), it was very interesting to see that everyone’s work looked like they belonged to together but, at the same time, they didn’t. This was because you could notice everyone’s personal style in their work, whether it was as subtle as their line work or the form of the objects. However, we each have critiques and advice for what we could improve on and how we could stay more consistent. Working on this project really gave me the experience of working with a real client, creating solutions to answer the brief, and working collaboratively in a group. I would give my group a 9/10 because I believe we created a really engaging, well-thought out event that students would want to come to. The “virtual” component of it is very unique and allows GDC to connect to its members all across the country. We also established a strong visual identity for the event, and created a broad range of collateral. This project really gave me a new perspective on the issues that Indigenous peoples suffer from and the importance of reconciliation in Canada. I decided to focus on the revival of First Nations languages in Canada, after reading about how all 32 of the surviving languages in BC alone are currently endangered. 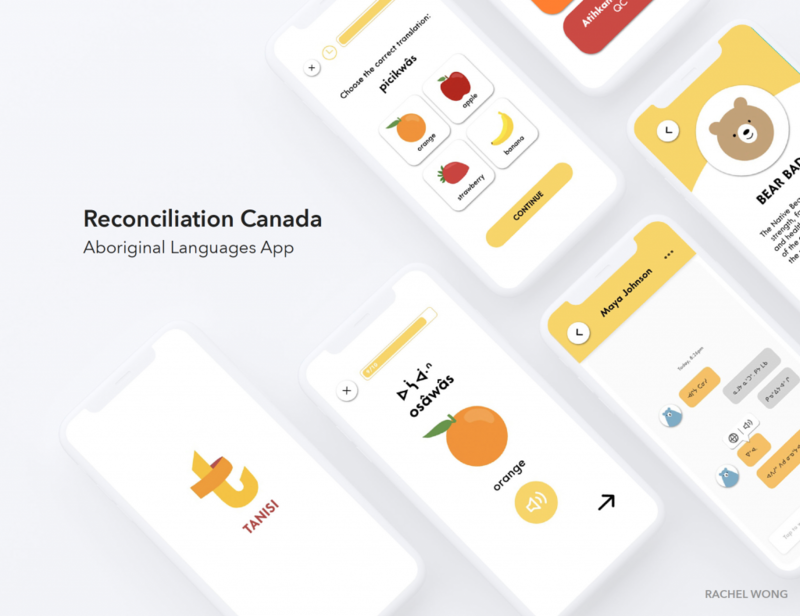 During my research process, I realized that there were not an immense about of resources for people to learn Aboriginal languages, and all the apps that were available looked outdated and were not engaging due to poor design. I wanted to create an app that would help teach Aboriginal youth their native language and make the process fun and interactive. In week 8, we had the opportunity to present our ideas to the Indigenous film students at Capilano. It was such a great experience getting to talk to and hear the struggles they had in-person. I received very useful feedback on my project from students Justin Leo and John Spink. Originally, I had wanted to create this app for two target audiences: one being Aboriginal youth, and the second being the general public. I thought, by getting other non-Aboriginals to learn as well, there would be a greater population speaking the languages. My second deliverable was billboard advertisements that would spark an interest to the general public to learn an Aboriginal language. However, Justin told me that some Aboriginals would not want other people learning their native language, especially before the Aboriginal youth. He told me that it is more important to get the app to the Aboriginal youth first, before considering (and also asking permission from the Elders) to release the app and encourage others to learn the language. I named my app “Tanisi”, which means “Hello” in Cree. The interface is friendly and easy to use, with a happy yellow colour theme that is inviting and visually exciting. You can learn three languages in the app – Cree, Squamish, and Chilcotin. I decided to focus on Cree, as there were much more resources online for me to source from. Tanisi has many unique features to aid the user’s learning experience. When learning a new word, you can record yourself saying the word and compare your voice as well as the soundwave shape to a native speaker pronouncing the same word. This helps with learning tone fluctuations and accents. There is also a “chat” feature, where you can communicate with friends in Cree. You can hold a message and hear it pronounced or have it translated. This helps you practice communicating in real-life conversation. There is also a “challenge” section, where you can race against the clock with friends to translate words and sentences as fast as possible. This makes the learning process fun, especially for youth. You can earn badges in the app as well. Each badge symbol will have a description of what that symbol means in a specific Aboriginal culture. The badge system encourages users to keep using the app and acts as a reward system. Overall, I am really proud of the work I have done for this project and I would give myself a 9/10 as I put a lot of effort into designing and creating the app to make it appealing and useful for my target audience. I also believe this app would be a very useful tool in aiding the revival and sustenance of Aboriginal languages. I didn’t want to just make “another language learning app”. Instead, I wanted to create an app that had many unique and useful resources to make the learning experience as easy and entertaining as possible. I directed my resume towards the branding and advertising agency, Toolbox Design. 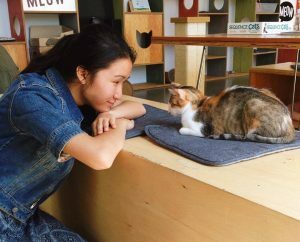 Through researching their past projects and also their company beliefs, there were several words that popped up in my mind: clean, young, friendly, trendy, and happy. In many of their projects, they use fresh colours including pastel pinks and blues. I chose to incorporate the same pastel salmon pink found in their project for “Southgate/Mapleview/Bayshore Personal Stylists” in my header name. Toolbox’s main typeface was very geometric and round. Initially, I was going to use the font “Avenir”, but decided to use “Averta” instead, which appears friendlier and more bubbly. I wanted to keep my layout clean and comfortable, as this comes across on most of their projects. My favourite project that they worked on was the Fraser Commons project, which completely embodies Toolbox’s fun personality. I drew most of my inspiration from this project. 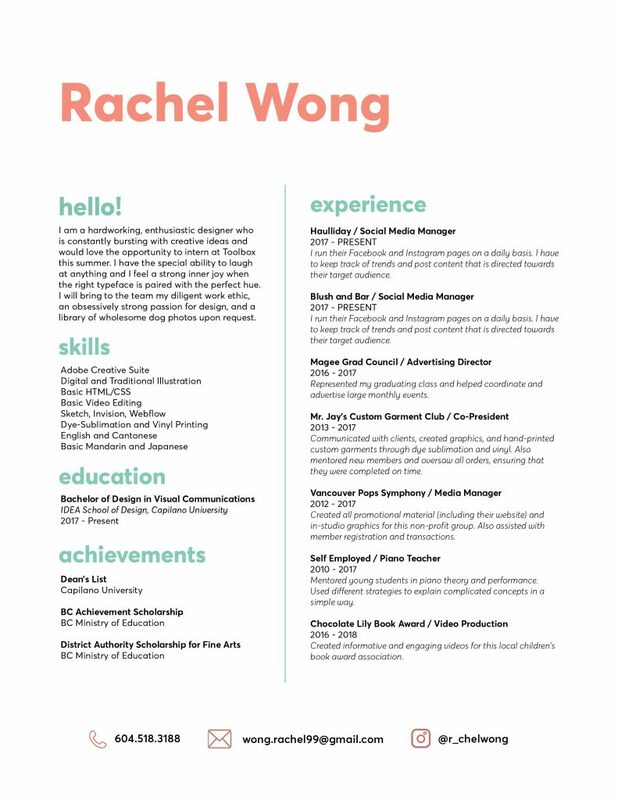 I would give myself a 9/10 as I believe my resume effectively caters to Toolbox through layout, text, hierarchy, and colour. I think if I incorprated some textural or illustrative elements into my resume, it would make it stand out more and add more personality. For my Design Manifesto, I chose to outwardly address the issues of consumerism and declare our responsibilities as designers in regards to these issues. My goal was to realign the priorities of designers from “making things pretty” to creating smart, sustainable work. In my writing, I chose to use a strong tone of voice with an interesting hook in the first paragraph to keep readers engaged. In the beginning stages of this project, I struggled with writing an actual “manifesto,” and wasn’t sure how to write one. I spent time researching and reading manifestos of various topics to see the different types of writing structures I could use. The second half of my research was focused on the sustainability aspect. I browsed countless sites which spoke on sustainable design as well as Judy’s presentation slides and took notes from both sources. I have attached some of my notes below. During Judy’s lectures, we learned that seemingly minimal tasks, like sending a text or opening an email can create a carbon footprint. That’s right – sending a short email can add about 4g of Carbon Dioxide to the atmosphere. I chose to create my poster around this idea and decided to address my manifesto as an email to all designers. 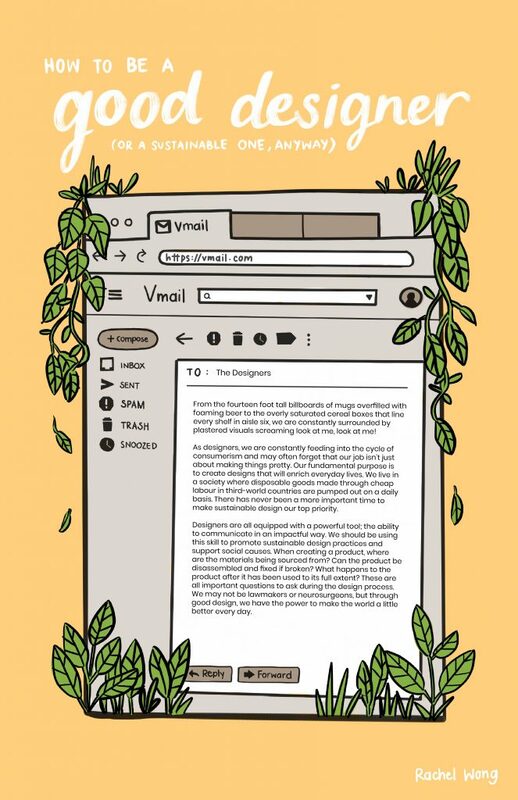 I illustrated greenery growing out from the corners of the email browser window to symbolize a sustainable aspect bursting out from the grey, mundane component. I decided to hand-write all the text in the poster (except for the email body text) to add a hand-made aspect that would contradict with the uniform text of the actual manifesto. I am very happy with how this turned out! I would give myself a 9/10 on my poster. My main concern that frustrated me during the illustration part of my process was the placement of the title text. I fiddled with many variations of placement and it was mainly the descenders of the letters “g” and ascenders of the letters “d” in my title that were causing the problem. I tried to write my title in all capital letters instead, but I felt that it created a much more serious tone to the poster that I did not want. All in all, I am overall satisfied the layout that I eventually concluded with, as well as the bright yet subdued yolk-yellow background colour I chose. I believe my poster resonates with my written piece effectively and represents my style accurately as well. “How to Write a Personal Manifesto.” The Art of Manliness, 7 Nov. 2018, www.artofmanliness.com/articles/how-and-why-to-write-your-own-personal-manifesto/. “How to Write a Manifesto, with Manifesto Writing Examples.” Benedictine University CVDL, 28 June 2018, cvdl.ben.edu/blog/how-to-write-a-manifesto/. “How to Write a Manifesto.” Alexandra Franzen, 9 Nov. 2017, www.alexandrafranzen.com/2015/12/31/manifesto/. “How to Write a Manifesto: Guides.” A Research Guide for Students, 11 July 2018, www.aresearchguide.com/write-a-manifesto.html. “1000 Words: A Manifesto for Sustainability in Design.” Core77, www.core77.com/posts/40586/1000-Words-A-Manifesto-for-Sustainability-in-Design. 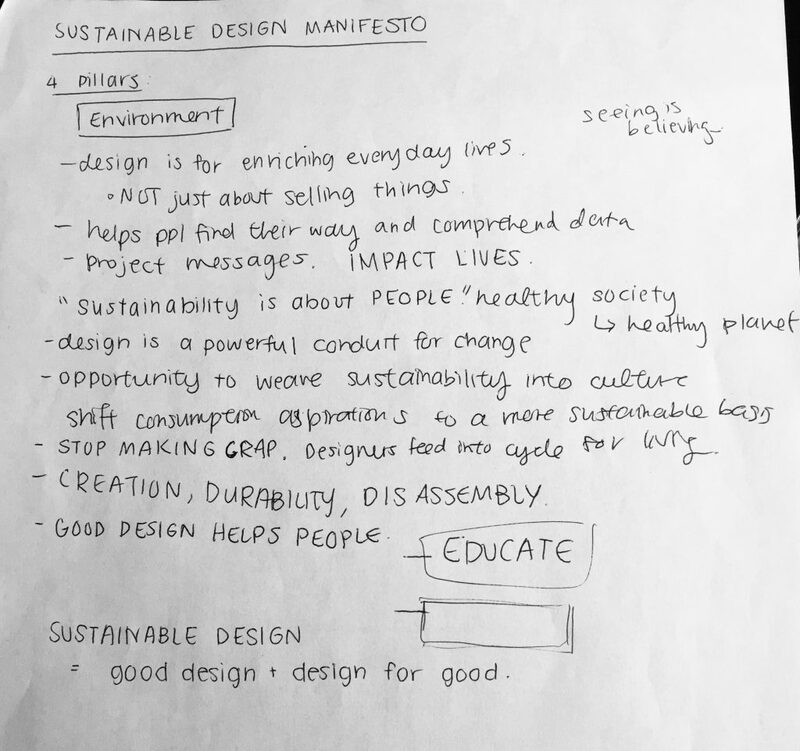 “Sustainable Design – What Does It Really Mean?” Architecture . Construction . Engineering . Property, 31 Jan. 2017, sourceable.net/sustainable-design-what-does-it-really-mean/. Imagine a world where the term “driving” is obsolete and a parking lot can not be seen for miles. The streets are empty and nature has pushed its way through the cracks of the smooth cement. A car drifts by, but there is nobody in the driver’s seat. One may think they are in a dystopian world where much of civilization has vanished and the Earth is returning to its natural state, but this is simply a world with driverless cars and less parking spaces – a reality that could soon be true in the near future, as described in Clive Thompson’s article, “No Parking Here”. In this article, Thompson expresses how frustrating parking issues and environmental concerns that surface from inefficient space planning, the diminishing number of purchased cars from the younger generation, as well the successful application of public transportation in modern cities are all compelling reasons of why driverless cars will positively change our world. In a period of curiosity, innovation, and productivity, it is only a matter of time that our urban space expands to one with driverless cars, which will obliviate the need for large parking lots and remove stagnant traffic, consequently decreasing pollution levels and enhancing our environment. The introduction of automobiles unlocked a world of possibilities for those living in the urban area. Vehicles gave their owners the freedom to work, eat, and live in places that would otherwise take hours to walk to. However, the popular option of owning a car has created havoc in the city, leaving cars idly waiting for parking spots while the sheer quantity of these massive, moving heaps of metal can be seen laid strewn at every block, with, as Thompson notes, “the average automobile [spending] 95 percent of its time sitting in place” (1). A 2011 study at the University of California-Berkeley estimates that the United States has about “a billion parking spots…[amounting to almost] four times more parking spaces that vehicles” (1). Even with these mind-boggling statistics, people are still found spending about 20 minutes per trip just searching for an empty spot. For this reason, the action of simply circling around hunting for empty spaces has made driving a burden and the thought of owning a car a nuisance. With self-driving cars, one would not have to waste time searching for a parking spot, as new technology would allow the car to drive itself around to find a space, after dropping the passenger off at their desired venue. This would dramatically reduce the amount of parking spaces needed, as people would not have to worry about parking at a nearby location in fear of the walking distance. With countless documentaries, articles, and social media campaigns blasting facts about global warming and greenhouse emissions, it is not surprising that today’s society has become more self-aware about their ecological footprint. The introduction of self-driving cars would reap various environmental benefits, including less pollution and more community parks filled with lush grass and air-filtrating greenery. Totaled up, all the land devoted to parking amounts to “roughly 6,500 square miles” (2) – mostly unused land that could be developed from mundane grey slabs of concrete to parks and playgrounds that would both enhance the environment and bring the community together, a concept that is very much needed in this planet that we have polluted and drained of its resources. A great example of an eco-friendly city that could benefit greatly with more self-driving cars is Vancouver. The city has extensive transits systems, bike share programs, and numerous bike lanes allowing one to conveniently reach their destination without driving. Vancouver also has several car share programs that are widely used, each with designated parking spots that can easily be accessed in popular locations. Though the city has a large driving population, the current options allow residents to minimise the amount of “‘cruising’ for parking…[which] burns 47,000 gallons of gas and generates 730 tons of Carbon Dioxide a year” (1). As the proposed self-driving cars would be fully electric, Berkeley lab scientist Jeffrey Greenblatt deduces that “emissions would be 90 percent lower” (7), even if cars were left “cruising around”. As a fellow Vancouverite, I can attest to the fact that I always avoid driving a car to Downtown, Vancouver as the search for free (or cheap) parking is nearly impossible. There is always an abundance of traffic clogging every lane, with five-seater cars only occupied by one person. Electric, ride-sharing driverless cars would be highly effective in Vancouver as there are only so many routes one could go in this small, crowded city; one is bound to meet another heading in the same direction. In his paper, Thompson emphasizes that the concept of self-driving cars would surely excite millennials and provide them with a relatively cheaper and more eco-friendly transportation method (5), especially if their lifestyle requires a vehicle as opposed to public transit. Most of the younger population rely on the popular new ridesharing service “Uber”, with “70 percent of [the service’s] customers [being] under the age of 34” (5). Only two years ago, Uber reported that “its drivers were making 1 million trips per day” (5), proving that millennials have found a way to get around without the need to own or drive a car. Thompson’s article suggests that the self-driving cars could be used for a ride-sharing program, further decreasing the number of five-seater cars that are frequently occupied by only one passenger. A similar system made by Uber called “Uber Pool” has already observed rapid growth, with nearly “50 percent of all Uber rides in the [year-old program introduced in San Francisco being] pooled” (5). Surely, if self-driving carpool systems were introduced in other North American cities such as San Francisco, they would be received very well. In conclusion, the concept of driverless cars would, with no doubt, be highly beneficial by increasing the sense of community in urban spaces through the addition of new parks in place of deconstructed lots and providing the population with a convenient and safe mode of transportation, with vehicles that have the technology to detect millions of objects of a time, most of which your average driver would not be able to see (6). Driverless cars would also diminish the need for vast, empty parking lots with urban thinkers estimating that “90 percent of our current lots” (8) would be eliminated in only 15 years from now. According to data produced by a group of MIT scientists, “if 50 percent of drivers shifted over to ridesharing, it would reduce traffic congestion by 37 percent and decrease the number of vehicles on the road by 19 percent” (5). These statistics only further emphasize my point of how necessary ridesharing and self-driving vehicles are, especially in cities such as Vancouver. As millennials are always seeking to make the world a better place through change, I am confident that many will be eager to enter this seemingly dystopian future of less cars and more nature, in hopes of saving our environment and erasing the negative stigma around cars and driving.